The agreement reached between MTorres and both companies is the respective fifth with each one for the same type of machine. The fifth machine acquired by GKN will be installed at its plant in Western Approach (Bristol, UK); in the case of SPIRIT, their fifth TORRESFIBERLAYUP will be installed based in Kinston (North Carolina, USA). The know-how developed during the last years by MTorres, result of the strong investment in R&D and innovative capacity which characterize the company, was again decisive to convince their customer to hire these lamination equipment designed by MTorres. These new contracts reinforce even more the world leadership of our company in the technology of Fiber Placement. 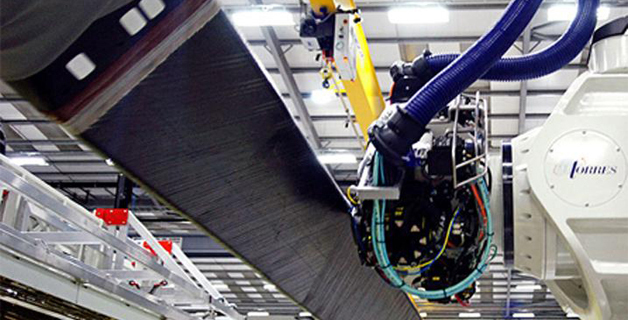 It should be highlighted the trust placed, since the process of manufacturing and laying-up of carbon fibre wing Spars is a complex process, which requires column type 'fiber placement' machines that work synchronized with a head-stock tail-stock of 11 m. long and 15 Tn load. The British GKN, obtained a contract to manufacture the rear Spars of the wings of the A350 XBW, which are smaller than the front Spars, manufactured by the American SPIRIT. Two important agreements more, with demanding and recognized customers as SPIRIT and GKN, which reinforce MTorres branding, and positions it as a world leader in the supply of equipment for lamination of structural components for the aerospace industry.